There are foods we associate with certain occasions, and this soup is one such dish. Shurbad is synonymous with Ramadan (the month of fasting for Muslims). For breaking the fast, you need a highly nutritious dish that will catapult you from the world of the barely living to the heights of energetic vigour (assuming you do not overeat and slump down hopelessly). Whoever came up with this dish was definitely a genius. He or she (most probably a she) sat down and threw at it every wholesome ingredient that was available. It has a great balance of fat, protein, and carbohydrates bound together by flavour and gentle patience. 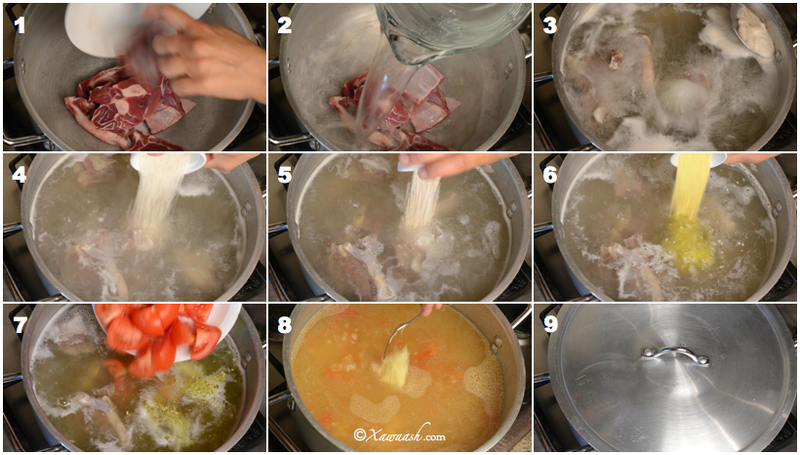 Traditionally, this soup was prepared with barley and goat’s head (relax, we did not use it in this recipe). The barley would be crushed with a grinding stone, then added to the pot after boiling the head for a couple of hours. We are sure that by now you are happy we did not use the traditional recipe. However, do let us know if you want us to get authentic. 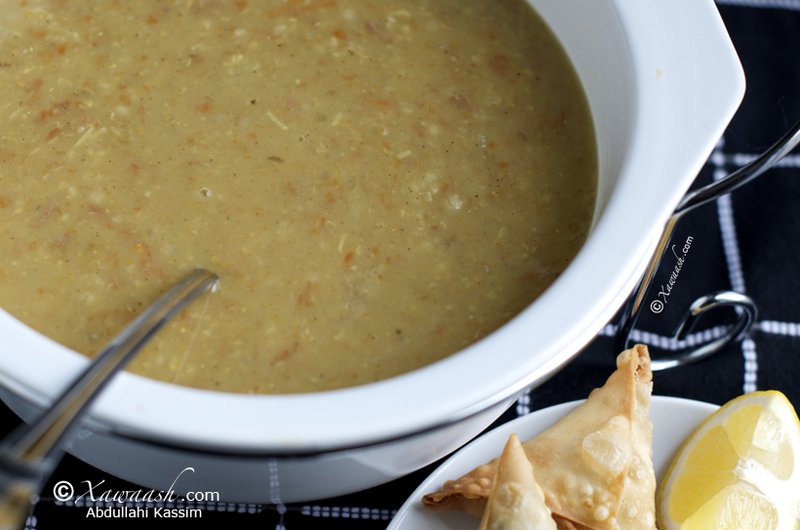 The soup was only prepared during the month of Ramadan and is usually served with samosas and bajiya. It is a chunky soup with grains, onions and chunks of meat. This is definitely not a soup to give to a picky, finicky eater unless you first liquefy it in a blender. It is a hearty, comforting, and utterly satisfying soup that will provide you with enough fuel for the next day’s fast. Il y a des plats que nous associons à des occasions particulières, et cette soupe est un de ces plats. Shurbad est synonyme de Ramadan (le mois de jeûne pour les Musulmans). Pour rompre le jeûne, vous avez besoin d’un plat très nutritif qui vous catapultera du monde de l’à peine vivant au plus haut de la vigueur et de l’énergie (bien sûr si vous n’en mangez pas trop et vous effondrez complètement). Celui ou celle qui a créé ce plat était certainement un génie. Il ou elle (probablement plus elle) s’est posée et a rassemblé tous les ingrédients sains qui étaient disponibles. Le plat est un parfait équilibre de matières grasses, protéines, et glucides combinés par la patience et la saveur. Traditionnellement, cette soupe était préparée avec de l’avoine et une tête de chèvre (pas de panique, nous ne les avons pas utilisés dans la recette). L’orge était écrasé à la meule, puis versé dans la marmite où la tête a bouilli pendant deux heures. Nous sommes sûrs que vous êtes contents de savoir que nous n’avons pas utilisé la recette traditionnelle. Mais faites nous savoir si vous voulez qu’on fasse l’authentique. 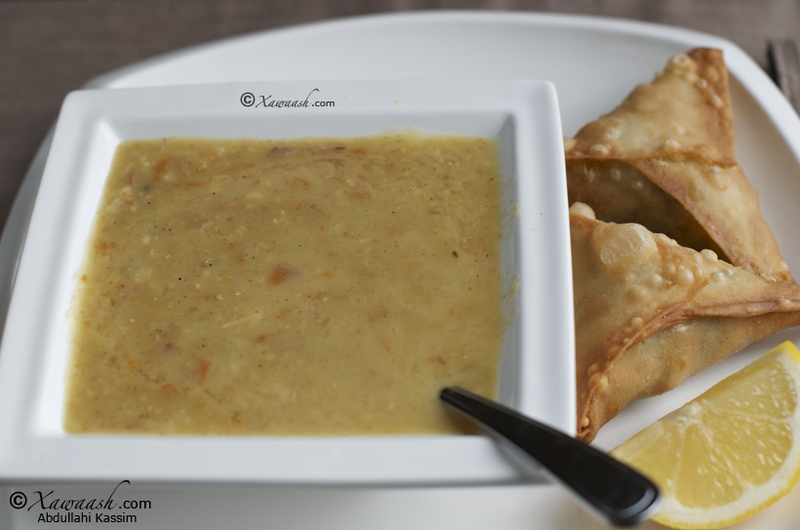 La soupe n’est préparée que pendant le mois de Ramadan, elle est servie avec des samosas et des bajiyas. C’est une soupe consistante, avec des céréales, des oignons et des morceaux de viande. Ce n’est pas une soupe pour les personnes difficiles qui demandent qu’elle soit mixée. Elle est riche, réconfortante, et tout à fait rassasiante, elle vous donnera assez d’énergie pour le jour de jeûne suivant. 1. 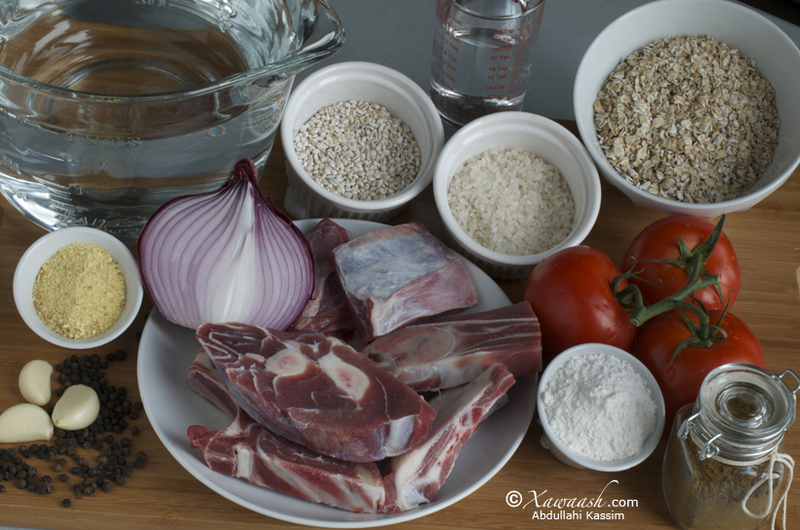 Place the lamb meat in a pot set 0n high heat. 2. Add the water and bring to a boil. 3. Skim away the impurities. 4. Add the rice. 5. Add the barley. 6. Add the Vegeta or bouillon cubes or salt. 7. Add the tomatoes. 8. Add the garlic. 9. Cover and cook on medium heat for 1½ hours. 1. Digsi dab sare saaran, hilibka ku-rid. 2. Biyaha ku-shub. 3. Markuu karo, xumbada ka-qaad. 4. Bariiska ku-shub. 5. Sareenka ku-shub. 6. Maraq qudaarta ku-dar. 7. Yaanyada ku-dar. 5. Tuunta (toonta) ku-dar. 6. Dabool oo hal saac iyo bar ku-kari dab dhexdhexaad ah. 1. Faire rissoler la viande d’agneau dans un faitout sur feu fort. 2. Ajouter l’eau et porter à ébullition. 3. Écumer les impuretés. 4. Ajouter le riz. 5. Ajouter l’orge. 6. Ajouter le Vegeta ou les bouillon cubes ou le sel. 7. Ajouter les tomates. 8. Ajouter l’ail. 9. Couvrir et laisser cuire à feu moyen pendant 1h30. 1. Add the porridge oats. 2. Cook on medium heat for half an hour, stirring occasionally . 3. Remove the bones. 4. Prepare the flour thickener by combining the flour and water and mixing well. 5. Add the flour thickener. 6. Stir, lower the heat, and cook for 15 minutes. 7. Prepare the spices by first frying the onions in the oil until soft. Add the garlic and fry some more. Then add the xawaash, black pepper and turmeric powder and fry for 1 minute. 8. Add the spices to the soup and stir well. 9. Add the vinegar, stir well and turn off the heat. 1. Boorishka ku-dar. 2. Dab dhexdhexaad ku-kari muddo ½ saac. 3. Lafaha ka-saar. 4. Burka iyo biyaha isku qas. 5. Shurbadda ku-dar. Dab yar 15 daqiiqo ku-kari. 6. Basasha iyo tuunta saliidda ku-shiil. Markay basasha jilicdo, ku-dar xawaashka, filfisha madow iyo huruudda. Daqiiqad kale shiil. 7. Carcarafta shurbadda ku-dar, si fiicanna u-walaaq. 8. Qalka ku-dar, walaaq, oo dabka ka-deji. 1. Ajouter les flocons d’avoine. 2. Cuire à feu moyen pendant 1h30, en remuant de temps en temps. 3. Enlever les os. 4. Préparer la liaison en mélangeant intimement la farine et l’eau. 5. Ajouter la liaison. 6. Touiller, baisser le feu, et cuire 15 minutes. 7. Préparer les épices en faisant revenir les oignons dans l’huile jusqu’à ce qu’ils soient tendres. Ajouter l’ail et continuer la cuisson. Puis ajouter le Xawaash, le poivre, et le curcuma, cuire 1 minute. 8. Verser les épices dans la soupe et bien mélanger. 9. Ajouter le vinaigre, bien mélanger et coupe le feu. This is macaan.com I am glad to be the first person to comment on this may Allah bless you guys with all the hard work you do. Excited for this ramadaan IA Sambuus and shurbad it is. Btw, can you guys please make “icun” icalaanji caloosha igeli. Thank you for taking the time to comment. Icun is on the list, we will get to it in due time. Walaasheenna qaaliga ah aad ayaa u-mahadsan tahay. waxaan rajaynaynaa kuwa Ramadaan ka-faa’iidaysta oo khayr ku-dhamaysta inuu Eebbe naga dhigo. Jazaakillaah khayr. hi guys,great reacipe for ramadan,the thickner cani use flour thickner insterd coconut milk?if i used coconut milk how much,any ingridients i have to use or less please let me know.in sri lanka we call canji made out of rice meat or chicken like porridge lastly we add coconut milk.its allways we had before we braking the fast in holy month of ramadan.may allah bless you & ur familey.making useful thing others get benefit.time will be the essence, you guys sharing your preshes time to make this video.im gratley apperciate that thankyou. may allah give you live long life aameen,aameen,yarabal aalameen.by the way im still waiting for shrimp recipe when you get a chance.let me know the coconut milk pls im gone try before ramadan thanks love ur cooking bye. Thank you so much for commenting regularly. You can add coconut milk but it will not thicken the soup. If you don’t want to use any thickener, we suggest that you cook it longer and add the coconut milk towards the end. As for the shrimp please be patient. We are trying to post as many traditional Ramadan dishes as possible, but shrimp is definitely on the list. hi,beside calrosa rice cani use basmati or red rice or sambaany other pls ty. It is preferable to use short grain rice, but you can use any rice of your choice. 1- Qudaar sida karooto, bataato (baradho), digirta cagaaran, oo biyo lagu kariyay kaddibna la-shiiday. 2- Bataatada macaan oo la-kariyay ama la-foorneeyey. 3- Furuutada, muus la-jarjaray oo oranjo lagu kor miiray. Tufaaxa hadday nacaan biyo ayaa ku-karin kartaa. Caruurta dhaqso ayay ka-daalaan cuntada. Waxaa fiican hadba inaad u-beddeshid. Qudaarta marmar bariis biyo lagu kariyay oo la-jilciyay ku-dar. 4- Furuutada casiir uga dhig. Sokorta ka-ilaali. 5- Caanaha waa muhiim laakiin waqtiga cuntada ka-fogeey. Waxaan ka-coddsanaynaa beesha Xawaash hadduu jiro qof qibrad u-leh cuntada caruurta inuu la-taliyo walaasheenna Hani. Mahadsanidin. In my opionion parents should follow Canada’s nutritional food guide or seek advice for their doctor. It is important for children to eat all the main four food groups, for example: Dairy, Grain products, vegetables & Fruits and Meats. Each food group contains the necessary nutrients to help them grow strong and healthy. Also reduce their intake of sugar, like soda and sweets. and pay attention to their portion intake, to much food can make them gain weight, limit their portion to small amounts every couple of hours. Sister Khadija, thank you very much for your advice for our sister Hani. Assalamualaikum Masha’Allah i love your recipes and tried out a few and they came out amazing , i wanted to make this but the quantity is rather large , if i reduce it to say making it for about 6 – 8 people should i just reduce the water and meat? Wa-alaykum as-salaam, you can halve the recipe to get 6 servings. Use half the meat, water, porridge oats, etc. Please note that 1/4 cup is equal to 4 tablespoons. So use 2 Tbsp of rice and 2 Tbsp of barley. 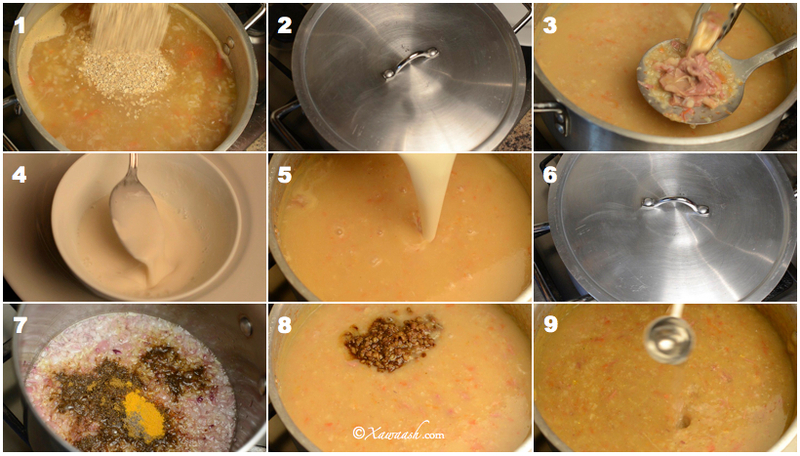 However, we strongly recommend that you make the full recipe and freeze the remaining soup for another day. You can freeze the soup for 2 months. In our household, we cook just twice during the month of Ramadan and freeze it in small containers. Thank you very much. We have a lot of Ramadan recipes on the way. Hope you like them. What would you recommend Knorr or Maggi? & is 1 Tbsp Vegeta Seasoning Mix really equivalent to 2 Maggi or Knorr bouillon cubes? Thanks for the great recipe!!! Somalia’s Test Kitchen says yes, 1 Tbsp Vegeta Seasoning Mix is equivalent to 2 Maggi or Knorr bouillon cubes. We found Knorr to be more flavourful but it is a matter of personal taste. The Vegeta we use does not contain Monosodium Glutamate (MSG). Thanks. You can substitute chicken legs with goat meat. You can also add chicken broth for a better taste. Thank you for the comment. I’m going to try this for ramadhan insha’allah, I’m a new cook but your site has been a source of much inspiration and ideas and has helped me tremendously, thanks for the great recipe! You mentioned you only cook twice during ramadhan what dishes do you make that enables you to do that? Thank you for your comment. We do not cook just twice in Ramadan. We cook certain foods such as shurbad, sambuus, and fataa’ir once or twice in Ramadan and freeze them in small quantities. We try to save as much time as possible because Ramadan is not about food. If you were to ever get tired of the Shurbad, you can try the vegetable soup. Thank you so much for your comment. Ramadan Karim. Walaal Hodan, aad ayaan ugu faraxsan nahay inaad jeclaatay ood na ka-faa’iidaysanaysid Xawaash. 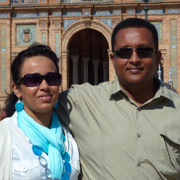 Waa ku-mahadsan tahay hadalada wacan aad inoo soo qortay iyo ducada fiican. Qayr badan oo aan dhammaan Ilaahay ha ku-siiyo. Nala socodsii shurbadda sida ay ku-soo baxdo. I would like to try this soup but is it ok if I skip the spices. Or can you recommend me other substitutes. You can replace the spices with ground cumin and/or coriander seeds. Me and my wife always wanted to learn how to prepare this delicious “shurbad” since we were introduced by a close bravanese couple. You guys continue to amaze us with your superb cooking talent coupled with your creativity..Rabi ha idiin zaa’idsho. Thank you very much for your wonderful comment. We have the best viewers. You guys never fail to amaze us with your wonderful comments. We are happy you found what you were looking for in the website. God bless you. It is not quick oats, but there is no problem in using quick oats. ASC.Bacdasalaam.Ma’samayn karaa inaan markaliya digsiga daqadka ku shubo aan ku kariya,carfiskana kabacdi kudaro?.Mahadsanid. Waa ku karin kartaa, laakiinse waqti ka yar ayuu ku karaaya. Ramadaan Kariim walaal. Asalamu aleikum A& L, today I made shurba, mashaAllah it was super yummy!! we loved it. Even when we opened our fast, didn’t have to adjust the taste for salt or vinegar, it was just perfect! Thank u very much for sharing. May Allah grant u all u wish for in this dunya n akhera. Masha’Allah. Thank you so much for letting us know. We are very happy you loved it. ASC walaalaheyge qaaliga ah, waxaan rabaa in aan idiin sheeqo in aan isticmaalay pictures from your page for my school project. aad iyo aad baad u mahadsantihiin. Waa ku mahadsan tahay inaad noo sheegtay, waxaanna rajaynaynaa project-ka inaad ku guulaysatay. ASC, Thank you guys for all the hard work and the help we get. May Allah protect you and your company grow inshallah. You guys made everything easy for us as young girls who newly married and trying to cook nice food for thier husbands on Ramadan. Again, you guys are the best and easiest website to use. Can I buy the vegeta seasoning and xawaash Spice mix from the resturant ? !